I included this recipe because when your dad would make cobbler, he would go to my cookbooks (which Adam has since donated to Deseret Industries) and one of them was a Betty Crocker Cookbook. I don’t know which recipe he used but I found this award winning cobbler recipe from Betty Crocker online. Tip: Mix batter as gently as possible, and you’ll be rewarded with a tender and moist cobbler! In medium bowl, stir together blackberries and sugar. Let stand about 20 minutes or until fruit syrup forms. Heat oven to 375°F. In large bowl, stir together flour, baking powder, salt and milk. Stir in melted butter until blended. Spread in ungreased 8-inch square pan. Spoon blackberry mixture over batter. Bake 45 to 55 minutes or until dough rises and is golden. Serve warm with cream. Makes 8 servings. 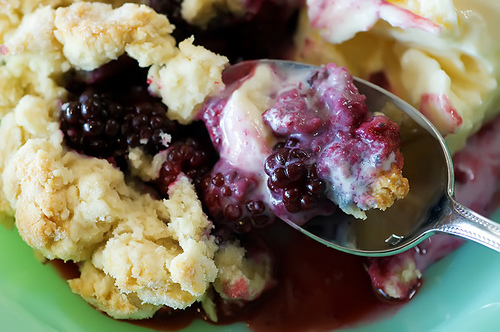 Can use half raspberries and half blackberries for a fun flavor combination.